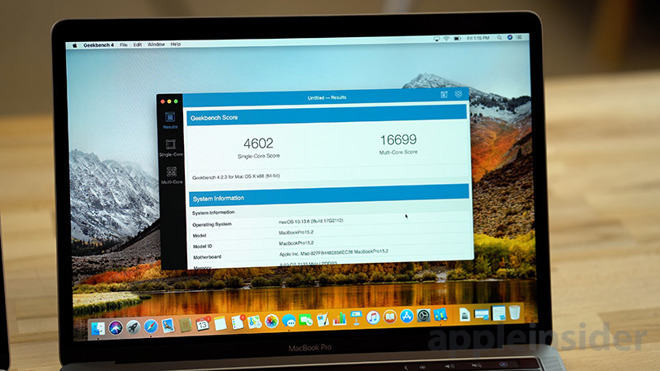 AppleInsider has both an i7 and i9 2018 MacBook Pro on hand, and it's time to do our own testing on the thermal throttling situation that positively afflicts the i9 model —at least at launch. In a video posted to his YouTube channel on Tuesday, Dave Lee shows the top-of-the-line MacBook Pro running Adobe Premiere Pro at surprisingly low clock speeds. Tests conducted put the average clock speed of the processors under load at around 2.2GHz, well below the advertised 2.9GHz. The internet's reaction to Lee's findings was about as expected. What is thermal design point? The Thermal Design Point (TDP) is defined by Intel as the "average power the processor dissipates when operating at base frequency with all cores active under a high-complexity workload." In short, it advises of how hot a processor can get when running at un-boosted capacity, and how much in the way of cooling systems a device manufacturer has to put in place to mitigate the generated heat. More on "unboosted" in a bit. Processors are created to run at a variety of different TDP levels, depending on their intended market. Processors meant for desktop computers can afford to have a higher TDP, while notebooks, mobile devices, and tablets tend to use processors with lower TDP values, due to the difficulty of cooling the chip down. According to Intel Ark, the processor manufacturer's specifications website for all of its chips, the 2.9GHz Core i9-8950HK has a TDP of 45 Watts, the same TDP as the Core i7-8850H and Core i7-8750H. The TDP itself is low, so it shouldn't require an excessive amount of cooling, and with identical TDPs across the board, this means that Apple could add the same cooling system across the board, regardless of selected processor. While a processor is cool, it will exceed its normal operating clockspeed up to its boost speed. This generates more heat, of course. As that heat builds, the processor will slow down to help dissipate the heat in conjunction with the cooling system. It can even go lower than the normal operating clockspeed if need be to prevent damage. This is why Lee was seeing clockspeeds lower than the normal operating speed —the processor decided it was too hot, and slowed down well past the normal speed to keep heat generation down to what it could dissipate through the cooling system. 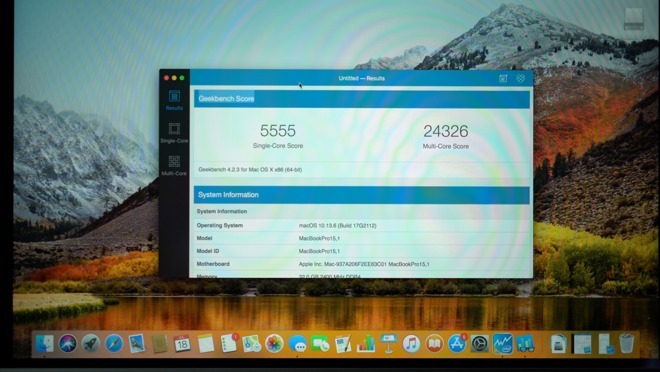 According to Geekbench, the 2018 MacBook Pro have astounding benchmarks. 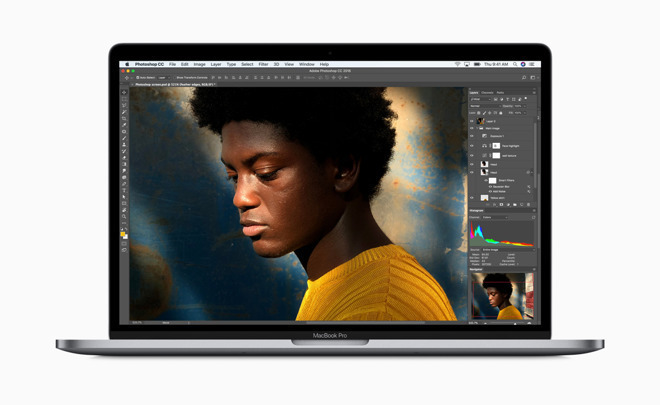 The "baseline" 2018 15-inch MacBook Pro with i7-8750H processor has a 21042 in multi-core performance, ranging to a 22439 for the six-core i9-8850HK in the high-end MacBook Pro. The benchmarks have come under fire from critics, with them saying that there are "breaks" to smooth out the performance. However, that does not appear to be the case. While there are pauses in the test, they are done at the end of each test, not in the middle. So, individual tests are performed under full load, with no cool-down period during the test to keep processor speeds low. In theory, the chips kept cool should be capable of delivering the performance illustrated by the crowdsourced Geekbench testing. The same processors in other manufacturer's computers perform the tests faster, and with less throttling —but all machines with the i9 chip do it to one level or another. 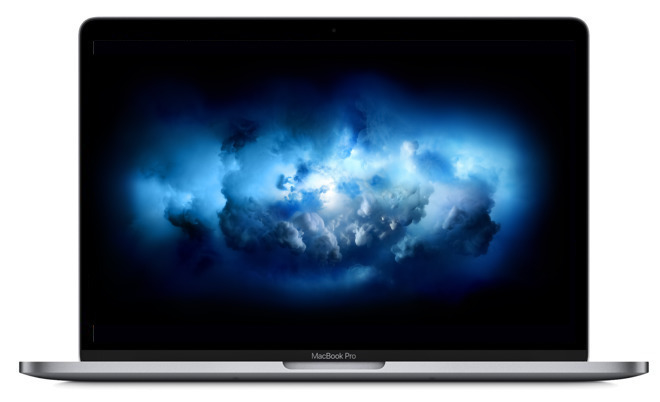 Apple's 2016 MacBook Pro chassis was designed more than two years ago. We got the first glimpse of it in a photograph in May of 2016. At the time, Intel was promising smaller and smaller dies, with lower and lower TDP to go with it. The company didn't make its own die-shrink projections. Even the processor in the MacBook Pro currently is well over 18 months late, according to Intel's ever-shifting timetables. Odds are, Apple was counting on this when it developed the enclosure. Apple is hardly the only vendor dealing with i9 thermal conditions, and like we said, Premiere performs far better with Nvidia GPU silicon than AMD Radeon gear which explains most of the Dell ripping through the test. However, while related, this isn't really the meat of the matter given that Lee put the MacBook Pro in the freezer and got better completion speeds out of it. 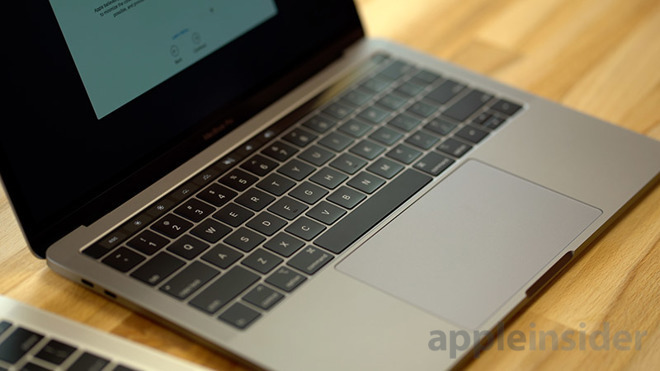 Video producer Lee suggested that the entire MacBook Pro cooling solution, an Apple-designed heatsink and fan module, is insufficient for the beefy (and hot) i9 Intel silicon as it stands. We don't know how well Lee's machine was running from a cooling efficiency standpoint, but given the history of the channel, we aren't expecting anything out of the ordinary. Our machines' cooling systems are running fine, and as expected. So, Lee is probably not wrong in his conclusions, given our own testing on the matter. This isn't a super-crisis, as long as this isn't another thermal paste situation, like back in the relative olden days. All manufacturers have to deal with it, and what varies is when the throttling kicks in as a result of the heat dissipation system engineering. And, it is rectifiable after-the-fact to some extent. The most obvious solution right now is for Apple alter the peak speed of the processor by adjusting the power that the chip gets. Ironically, slowing the peak speed of the processor may allow it to finish tasks quicker, as it will slow down less to keep the CPU cool. As PC overclockers are aware, this is a setting that can be altered. But, not in hardware by users as we are far, far down the road from jumpers that set clock speeds on Macs. We are presently looking at a few software options, and we'll get back to you with our findings. In an oddity of testing the fourth Cinebench run on the i9 MacBook Pro came in higher than the first, at 945. We expect that this is because the fans were already running at a good clip when we restarted the test.